As a Parragon Book Buddy, I got to check out this fun little activity book, Craft Factory: Dinosaur Adventure. It’s a hard spiral-bound book that includes eight pages of stencils you can trace and color. The punched pages have pictures on them to complete the scene, or you can start with the basic outlines and draw your own details. The book also includes a heavy page that’s attached to the back cover of the book, which you can fold down and place your paper on top of so that you have a flat surface to work on instead of trying to draw on top of other stencils or having to flip the book so you’re working flat on a table. The girl noted that it’s a great book for travel and happily drew in the car as we ran errands recently. 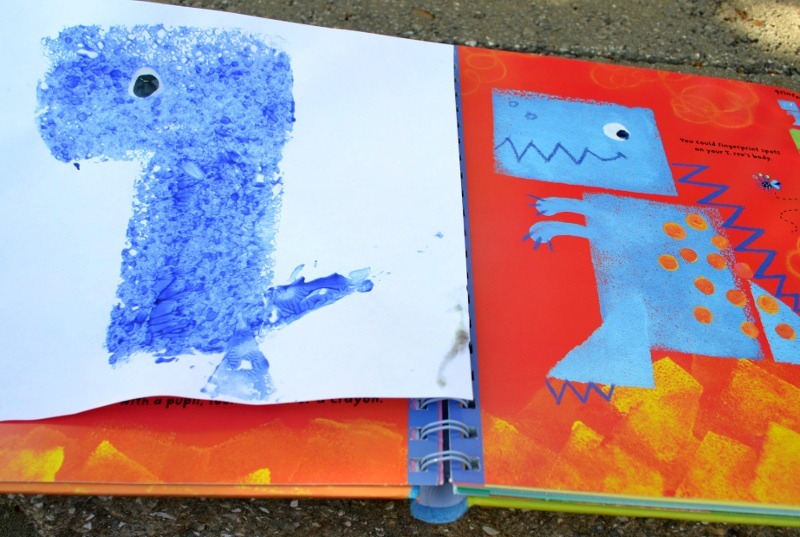 The textured dinosaur stencil kit from Melissa and Doug is a lot of fun and can be worked with in different ways. 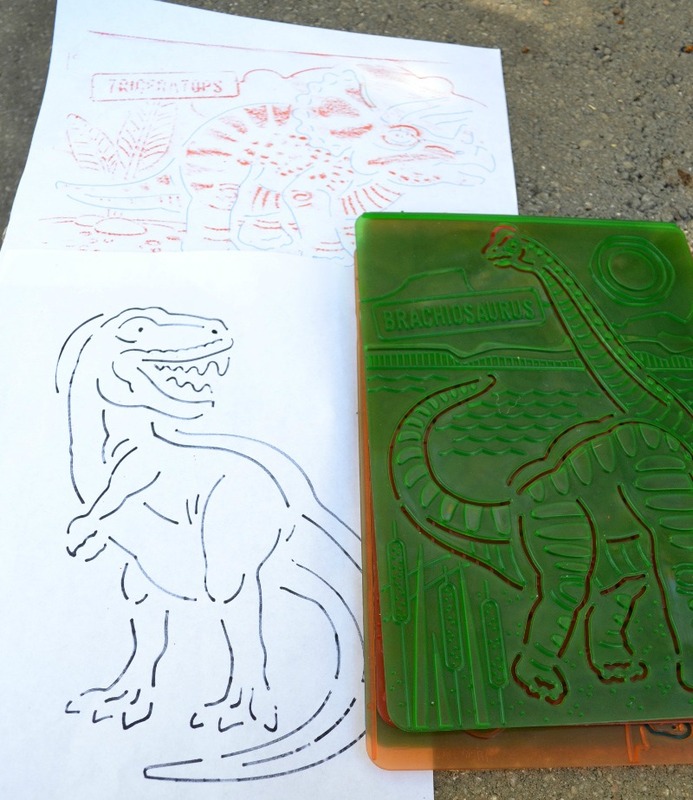 The stencils can be traced like normal stencils, but they are also textured so you can do a rubbing (flat-sided crayons are included) that gives more detail to your dino, then add the stencil lines. The girl got these for Christmas last year and still finds the rubbing part a little tricky, but she does like making the pictures. 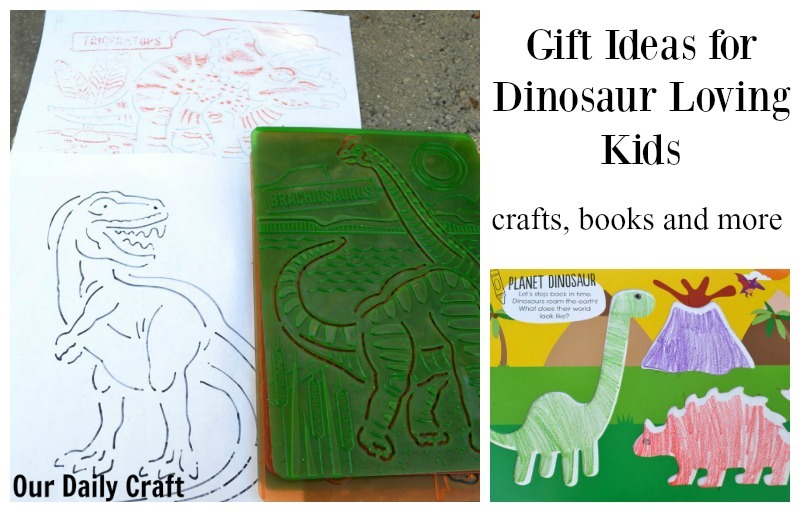 This might be a good choice for kids who love dinosaurs but maybe aren’t that crafty, because it could get them interested in creating something related to something they already love. It’s also a good gift idea because it includes the stencils, crayons, a pencil and an eraser, so all you need to get started playing with them is some paper. Melissa and Doug also has a fun dinosaur scratch art kit you might want to check out. This is a book the girl picked up at the used book store, and she really loves it. 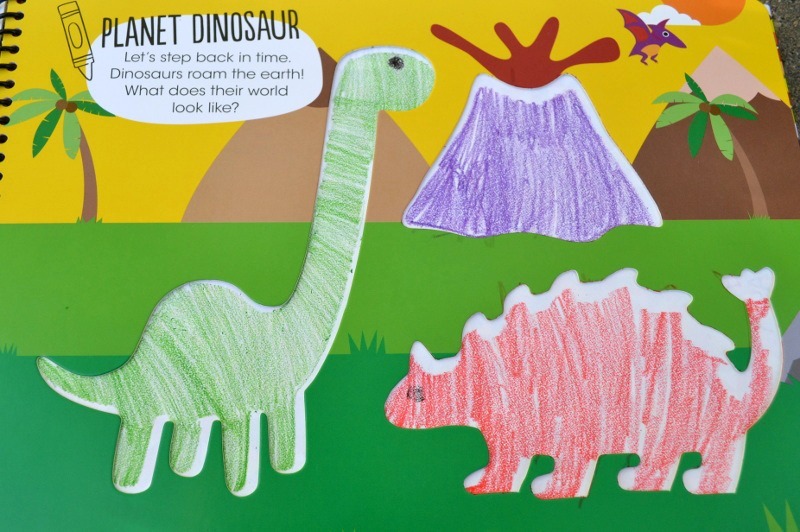 Usborne Preschool Activities Dinosaur Fun (which is so old I can’t find it on the Usborne site anymore) includes 11 easy crafts related to dinosaurs, from a printed T. rex made with a sponge to a plate-o-saurus, a cardboard ankylosaurus and a hatching dinosaur egg, to name a few. More Usborne books in the crafty dinosaur genre include (and I’m not an affiliate here, btw) Little Children’s Dinosaur Activity Book, Dinosaurs Sticker and Coloring Book and Step by Step Drawing Dinosaurs, among others. These are not necessarily crafty, but they are still a lot of fun for kids who like dinosaurs. Ten Little Dinosaurs by Pattie Schnetzler was another used bookstore find. It’s a counting down book in the vein of 10 little monkeys, but with dinosaurs. And the book has googly eyes, which is pretty cool. The girl loves the Magic School Bus series and they have several dinosaur-related books, including the Magic School Bus Flies with Dinosaurs (level 2) In the Time of Dinosaurs (picture book) the Magic School Bus Presents Dinosuars (nonfiction picture book for 1st through 3rd grade) and the Dinosaur Rescue Sticker Book. We’re also huge fans of Magformers in this house and they have a dinosaur set, which would be great fun for a dinosaur loving kid who also loves to build.